Single softball acrylic case with a solid walnut base. 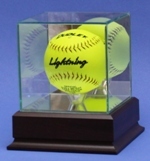 Softball acrylic display case has a wood platform base with a cherry or black finish. Comes with 1 free name plate. Engraving area is 6 x 1-1/4 so there is plenty of space. Inside display area is 5-1/4" x 5-1/4" x 5-1/4". of room on the base for a lot of engraved text. Price includes 1 free nameplate. Single acrylic softball display case. Features optically clear, richly beveled UV protected acrylic, all handcrafted and polished to a high luster. Also features a black acrylic base. This is not one of those cheap, mass produced display cases. This is a high quality investment in the protection of your memorabilia collection. Price includes 1 free nameplate. Additional nameplates are available. 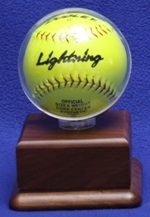 Single softball acrylic display case with beveled edges and black acrylic base. Acrylic display stand - holder for a single soft ball. It's unique 3 wing design holds the ball securely, but still allows for full viewing of the ball. 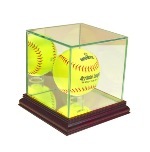 Ball Qube single softball acrylic display case with a walnut finish wood base. Features a mirrorred floor. Price includes 1 free nameplate. collection. Price includes 1 free nameplate. Single softball acrylic case for an official Clincher size Chicago Style vintage soft ball. high luster. This is not one of those cheap, mass produced display cases. Now display your softball like never before, in the absolutely incredible floating case. 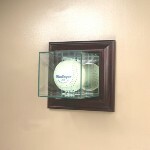 Wall mount single softball glass display case featuring a furniture grade wood frame and real UV protected glass and mirrored back. Inside dimensions are 5 x 6 x 5. Our unique hinged design allows for easy access. Mounting hardware is included. dimensions are 5 x 6 x 5. Our unique hinged design allows for easy access. Mounting hardware is included. and real UV protected glass, mirrored back and floor. Inside dimensions are 5 x 5 x 5.
protected glass, mirrored back and floor. Includes 1 free nameplate. Inside dimensions are 5 x 5 x 5. 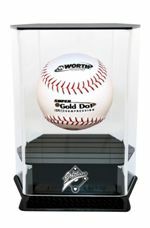 Wall mountable two tier - shelf acrylic case holds up to 8 softballs. The removeable - repositionable ball stands allow you to space the balls out. A door and key lock keeps inquisitive fingers away, as well as dust! 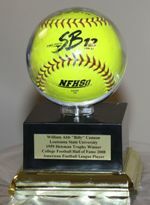 A great way to display your autographed or memorable softballs. secure balls. Door opens from bottom to the top. (balls are not included).